I would like to take this opportunity to thank the Cruisers Aquatic Club for their recent sponsorship towards my goal of swimming the English Channel. I am honored by their support and will do everything in my power to bring home some good news to share with the kids. 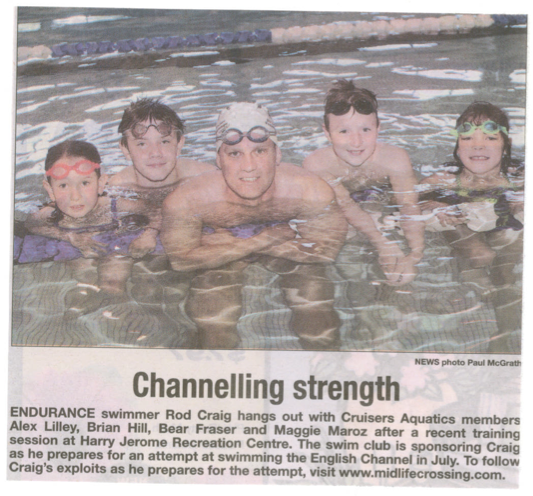 Thanks again to Rob Fraser (lane 4), president of the Cruisers and Carole Randle for your support. I recently attended the Cruisers annual pancake breakfast and had a chance to meet everyone, take a few pictures and introduce myself. I also managed to eat six pancakes. This is a great group of kid’s and adults promoting a sport that I love. I am thrilled to have this connection with them and look forward to addressing the club with good news of a successful crossing.